Hi, ladies. Can we talk about pants for archaeological fieldwork again? Last time we chatted, in May of 2017, I got loads of ideas about what to wear in Naples in July. Figured I'd revisit it to let you all know how I fared, what I'm going to bring this year, and see if you have any additional suggestions or updates. Last summer, I tried to get some free clothes out of companies to try out in the field. * I was only successful at getting some Red Ants Pants. While they're super sturdy and awesome, they were far too thick for summer in Italy. Another suggestion I got, though, was Rothco fatigues. I did buy a pair of these and wear them on site quite a bit. The multiple pockets were useful for stashing baggies, Sharpies, a trowel, and more. I liked the construction of them (didn't feel like I would split the seat of my pants bending over or anything), and liked the drawstring at the waist, but as all-cotton pants they were still a bit hot. I also brought a pair of Target pants with pockets and a drawstring waist that I liked a lot -- but proceeded to get paint all over this spring while touching up the trim in the house. Wasn't sure what I was going to pack for this July's fieldwork until couple days ago, when I happened to be at Old Navy buying new summer shoes for my girls. I found these pants -- mid-rise, linen-blend, wide-leg pants. Pockets! Drawstring/elastic waist! Linen blend! Cue the hallelujah chorus. This is exactly what I like to wear on site -- or at least, when working in a lab on site. 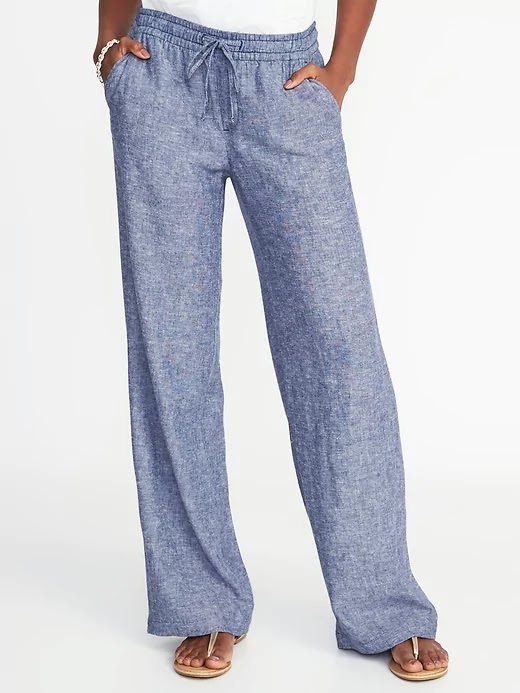 Not sure if these will hold up for strenuous excavation (they're at least better made than pajama pants), but for keeping me cool and covered in ridiculously hot and humid weather, these look perfect. They have them in numerous colors (chambray, olive, black, khaki, etc. ), so I'll be sporting them along with a tank top all damn summer. Woo hoo! Let me know in the comments how you did last summer or if you've found anything good to wear on a dig this summer. * I also got some free knives and backpacks from Victorinox and I lovelovelove all of them. I got the dual-compartment laptop backpack, since I had to drag my computer to site every day along with a ton of other stuff, and this totally fit the bill. Definitely bringing it back this year -- so consider buying one if you need to haul gear to site every day! I spent 16 weeks in the field this Spring. I bought numerous pairs of pants to try out. My fave are the Flexpedition from Duluth Trading company. I always wear Duluth Trading Co. in the field- everything they have is fantastic! I especially like their hybrid armachillo pants. 95% of the pants are typical "hiking" pants but the waistband is similar to sweatpants. Overall they are flexible, forgiving, and easy to get on and off! Also with the sweatpants waist you don't have any buttons digging into your stomach when bending over a lot.